Not long ago, Maxwell Simba was an ordinary Kenyan boy in high school. However, in 2017, his love for acting saw him edging hordes of other hopefuls to land a life changing role in Malawi to play William Kamkwamba in a Hollywood movie The Boy Who Harnessed the Wind. Earlier this year, the film’s director, Chiwetel Ejiofor, speaking to the press on the red carpet of the film’s premiere at the Sundance Film Festival, hailed Simba. “When I saw him on tape, I was sort of stunned by him. He had a great minimalist quality and could communicate all these emotions very simply, which is a technically difficult thing to do. He seemed to be doing that very effortlessly,” he said. At that moment, arguably many did not agree with Ejiofor until they watched Simba’s prowess as he played William in the movie which is an adaptation of a true-life story of Malawian United States trained engineer William Kamkwamba who, through a windmill innovation, saved his Wimbe Village in Kasungu from hunger. In his debut, Simba embodies the real William, with strong conviction and some poise, while Oscar nominee Chiwetel Ejiofor gives a supporting performance of controlled power as the boy’s embattled father, Trywell. Simba perfectly fitted in the role of William and for those that have watched the movie will agree that, at times, the 18-year-old looked like the real William. “That’s a bit of a tricky question to answer, let’s just say I love acting and music and also have a passion for lawn tennis,” he said in an interview. With all the stardom the movie has brought upon his once undiscovered life, Simba cherishes his role in the movie while celebrating the man who self-taught the skill of repairing local villagers’ radios with materials he scavenged from a scrapyard. Reading Kamkwamba’s story through a book from which the film is adapted from was the magic that Simba used to succeed as a protagonist. “I didn’t know much about William’s story, but after the first audition I grabbed a copy of the book and got to learn a lot about how everything went down. I read the book twice before going on set. “Other than that, I observed him from a distance when he came on set while we were still shooting in Wimbe. Identifying with some of his traits like the love for electronics and the levels of curiosity also played a huge role,” said Simba. After auditioning, Simba asserts he was at ease even after knowing he will be acting in a movie together with Ejiofor and that the film is based on a true-life. “I was hoping to land the role, but I was shocked and amazed at the same time. It was a lot to take in. To me it was a great honour working alongside Chiwetel who is an incredible actor and who has so much experience from his time in the industry,” he said. One tends to wonder how it must have been taxing for the young man to do a good job as the movie’s main character. The actor rates Ejiofor among the actors who inspire him. “After observing his work for quite some time and just seeing the love and dedication that he puts into it, I couldn’t help but feel admiration for his work. He knows exactly what he wants and makes sure he makes it happen. “I’m also inspired by Dwayne Johnson’s work. He makes acting seems so effortless, pulling off anything that he’s required to do. His sarcasm in most movies is also very impressive,” he explained. 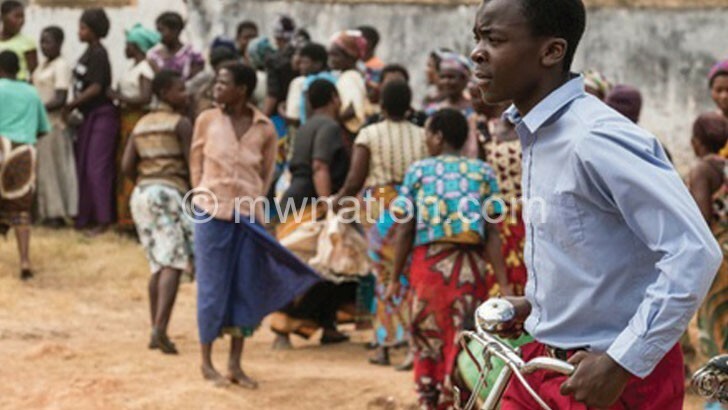 While the movie already premiered globally and here in Malawi, the young man continues to attract positive reviews on how he effortlessly fitted in the shoes on Kamkwamba. “Maxwell Simba is a good actor and he did a good job. I was surprised to read that The Boy Who Harnessed the Wind was his first major movie role.